A still image captured from video recorded by a camera-collared black bear. That's a piece of food, pizza perhaps, pulled from a trash can, and the bear's chin at the top right. The first thing wildlife research biologist Sean Farley would like you to know is this: The Anchorage Bear Camera Collar Project is a work in progress. Few conclusions relating to the project can yet be drawn. Yet even in its early phases the work he shares with a collaborative staff of wildlife research, management biologists and education staff is intriguing. 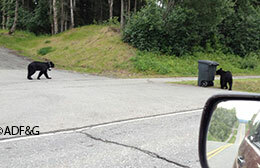 Last summer, Farley and a team of biologists captured a half-dozen bears – four black and two brown bears – in and around the urban areas of Anchorage and fitted the animals with collars fixed with video cameras and global positioning systems. Once collared, the bears were released to resume their ramblings while the cameras rolled and GPS units tracked. That a municipality of 300,000 people would be home to scores of black bears and dozens of brown bears is unusual by most urban standards. Indeed, the bear camera collar project in many ways chronicles a tale of two cities – one of people, another of bears – one thriving quietly, often all but unnoticed, within the bustle and racket of the other. The camera and GPS technology Farley has begun to employ could ultimately unlock mysteries for other wildlife researchers, enhance biologists’ management of bears within and beyond city limits, and enable educators to better teach citizens to co-exist safely with bears. Happily, the age of digital technology caught up with Farley’s needs last year. A bear collar series by Lotek®, a manufacturer specializing in wildlife monitoring systems, seemed suited for the job. Each collar was equipped with an onboard GPS and camera for recording video and sound. Farley managed to buy a handful of the units for summer 2012, when the Anchorage project’s first camera collars were deployed. The collars are battery driven and were set on the black bears to capture 10 seconds of video every five minutes, 24 hours a day. On brown bears, the collars were programed to record 10 seconds of video every 20 minutes, 24 hours a day, an adjustment meant to enable Farley and his team to capture data from the brown bears for a longer time period. The collar and video systems have limited battery and storage capacities, Farley explains, hence the need to adjust times to suit the duration of his research sequences. A GPS point marks the animal’s location every 20 minutes for both species and, finally, the collars are equipped with a drop-off device designed by Telonics®, an electronics company dedicated to the development of wildlife research technologies. The device allows the collars to detach from the bears at a pre-designated time (about six weeks for the black bears in this project) so the cameras and GPS units can be retrieved and the data they’ve gathered analyzed. Bears used in the study were captured in barrel traps or free-darted with immobilizing drugs as they ranged around town. The project’s first goal was to determine whether or not the collars would work. If they proved tough and reliable enough initially, Farley and his team would be poised to record and analyze the city bears’ daily habits, diets and more. A pair of bears investigates an unattended trash can. The bear on the left is wearing a camera collar. Photo by Dan Rosenberg. The first thing you see when the online video’s “play” button is tapped is a moving kaleidoscope of greenery, scarlet berries and flashes of white sky. Present in the center of it all, and vaguely humorous in the way that it brings to mind a certain television dog-food commercial (think “Bacon!”), is the tawny muzzle and slurping pink tongue of a feeding black bear. Because collar cameras are positioned on the lower portions of the bears’ necks, the muzzle and mouth is a feature common to all of the Anchorage Bear Camera Collar Project’s digital video footage. This particular video, titled “Natural Foods,” is a compilation of clips gathered by wildlife biologist Tony Carnahan, Farley’s assistant, from last summer’s collar cameras. Education associate Elizabeth Manning has in turn edited the clips, stitching them together to feature Anchorage black bears feeding in local greenbelts and wooded backyards. Short subtitles explain that bears are omnivores – they eat meat and plants – and that a variety of preferred bear foods found in nature are also available around the city. As part of the project’s education and outreach contingent, Manning is working closely with Anchorage School District educators sharing early bear collar camera insights –– with teachers and students through workshops and presentations. The students learned how biologists combine the GPS points, gathered 20 minutes apart, with corresponding video sequences to get a more accurate, visual idea of a bear’s meanderings between intervals. “You know, a bear doesn’t walk from Point A to Point B in a straight line,” says Manning of the connect-the-dots patterns mapped by the GPS points. It’s hard to believe that a wild black bear would stroll, largely undetected, anywhere near this area of expansive concrete parking lots and warehouses bisected by Dimond Boulevard, a major six-lane thoroughfare. But the GPS and accompanying video do not lie. A scene from a video clip showing a bear tearing open a trash bag. The bear's bewhiskered chin is at the top and his left paw is on the bottom. The video is available for viewing. Each spring, as sure as Southcentral Alaska’s days grow long and the Canada geese return to nest on Potter Marsh, Jessy Coltrane’s phones start ringing nonstop. Beginning around late April and May when local black bears and brown bears leave winter dens, the Anchorage area wildlife biologist and her assistant, biologist Dave Battle, spend much of their time responding to reports of conflicts between citizens and urban bears. Almost always they arrive with smiles and tips on how complainants can discourage bear encounters by cleaning up yards, putting away birdseed, trash and other attractants. Sometimes they bring along a shotgun to dispatch animals deemed dangerous or that have become chronic nuisances. From Coltrane’s perspective, the Anchorage Bear Collar Camera Project’s education and outreach efforts have the potential to make the city safer for people and bears. She also believes those efforts might eventually allow her more time to deal with other aspects of her job as a wildlife management biologist. “The educational aspect that Elizabeth (Manning) is working on is going to directly benefit some of our bear-human conflict issues that take a bunch of our management time,” says Coltrane. She believes that the videos will help residents of Anchorage – and beyond – understand why conflicts with bears occur and teach prevention. At the same time, Coltrane says, the research conducted by Farley and Carnahan promises to benefit management in other ways. For example, Coltrane asks, how many bears might it take to generate a cluster of a dozen calls, or two dozen, from concerned citizens from one side of the city to the other? Might a single bear be responsible for widespread conflicts? If so, why? Four video clips on the urban bear project are available for viewing, addressing birdseed and bird feeders; bears and garbage; bears and wild food; and bears and electric fences.